Not only is Paul Koller responsible for some of the greatest technical feats on the Commodore 64 (Super Bread Box, C64nabalt, and Micro Hexagon), his C64 demakes are also some of the most fun. 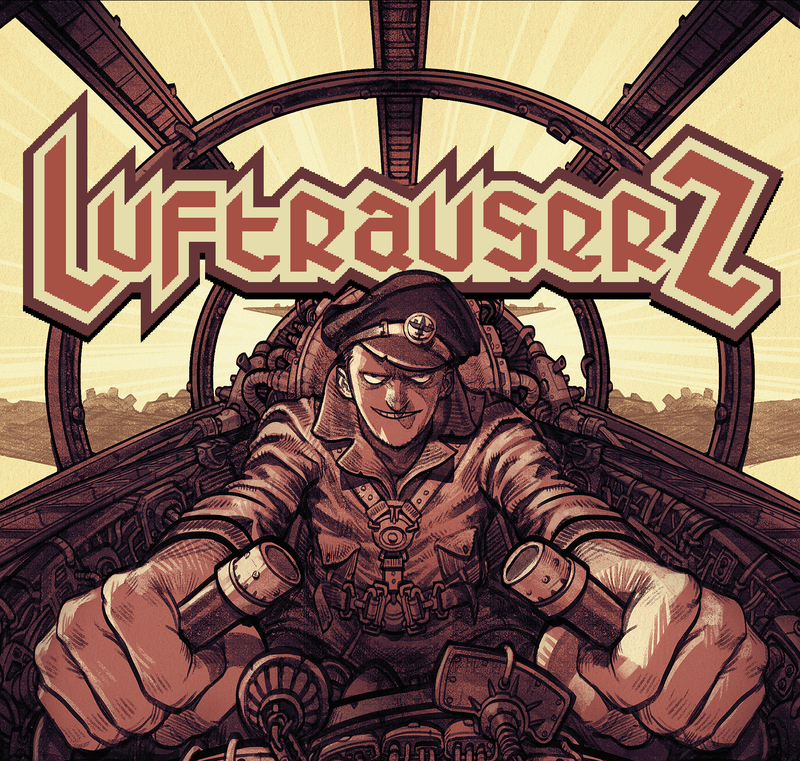 Specialising in backwards porting games from modern systems which he thinks would suit the C64 graphics and cpu capabilities, his latest game is an official port of the 2014 game Luftrausers by Vlambeer (Windows, OSX, Linux, PS3, Vita). It has taken three years to complete, and it’s easily his best yet. Set in an alternative universe's 20th century conflict, you are taken into the middle of a hostile sea in your submarine base. From here you can take off in your basic rauser (experimental sub launched fighter plane), where you instantly find yourself surrounded and under attack. 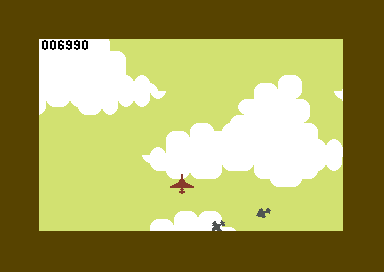 The enemy planes are smaller, slower and less powerful, but as you destroy the first few waves you'll quickly find out that they have even deadlier aircraft and ships dispatched with the sole aim of taking you down. After some time they will shoot you down, but if you managed to complete one of the set goals three times, then you'll unlock more technology to customise your rauser for the next game. The unlocked technology might be a new rauser weapon (laser beams, homing missiles etc), or better (and slower) armour, or an engine upgrade (faster boosting but slower turning). Each upgrade will drastically alter the control and weaponry on your rauser, and you'll need many many goes, before you've unlocked a combination which works best for your style. There are 125 different combinations of weapon, engine and hull.. and each combination will also have an affect on the dynamic in game soundtrack system. 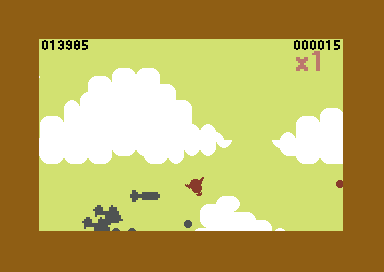 This is a multidirectional scrolling side on shootemup. You're free to travel in any direction, and I'm amazed at the sheer speed of it. The scrolling is virtually indistinguishable from the original. I was always impressed by the 50fps achievable in games like Hewson's Uridium... But I was very rarely able to fully appreciate the speed of the game, as I'd usually hit one of the many obstacles or get hit by something without a chance to react. In this game there's no terrain to negotiate, other than the sea which doesn't instantly kill you (or even da mage you with the submarine hull).. Even collisions with enemies will usually work out worse for them than it does for you. And this means you're free to fly, kill and boost away while recovering some health, in glorious maximum fps. Jets scream past you faster than you can blink, but lucky shots can bring them down. Later you might have a rauser customised for Melee fighting which means ramming enemies doesn't even damage you. 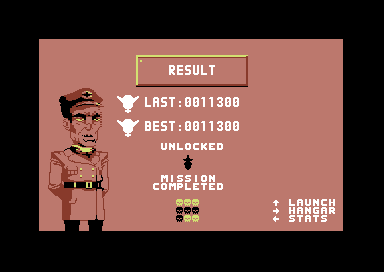 When you're not fighting hordes of enemies in your rauser, you can enter the hanger for managing your rauser configuration, view results where your in game statistics are tallied and stored and manage options for saving/loading game states or viewing cutscenes etc. This breaks up the frenetic gameplay nicely and gives you a chance to tweet screenshots of your battleship kills and high scores with your friends. (Here's mine). 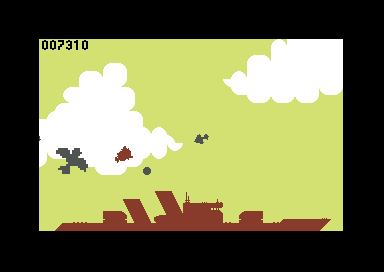 Cutscenes are played when you unlock something, or if you take down one of the game's mega enemies, like the Battleship. If you're familiar with the original version you'll notice that there are fewer enemies and bullets, but actually the gameplay is remarkably similar. Even my highscores on both platforms are not too dissimilar, so I think Paul's done a great job fine tuning the difficulty based around the C64s hardware limitations. Astonishingly the game's press release proudly announces that just the player's sprite animation frames total over 4000, which may well be a C64 record! Regarding compatibility with your original hardware configurations, there are a few things worth knowing right now. The cart uses GMOD2 technology, which means it comes with 512mb of RAM built in to the cart, so it doesn't require any additional hardware on the C64 side. However, only PAL machines are currently supported. While the cart version was available briefly on RGCD's store page, this quickly sold out, but don't give up, more batches of carts will be released periodically so keep checking with them for physical availability. The game is also available as a download from the fabulous Itch.io game store. The download version comes with a version of mac and win vice packaged, but you can use your own emulator of choice and it should run the game no problems. The itch.io page does mention compatibility with Turbo Chameleon and 1541 Ultimate cartridge for running the download version directly on original hardware, but it has been confirmed in the Turbo Chameleon's support forum that due to some eeprom checking code on the .crt file, the game’s download version will not run from standalone on a Turbo Chameleon. Although you can make it run by bypassing the eeprom checks with the TC’s machine code monitor. 1541 Ultimate and Easy Flash carts do run the game standalone no problems. You can also check out some gameplay video footage I recorded here, and Rob Caporetto’s fantastic video review here. Put up your high scores on Twitter, and put links in the comments if you fancy an online battle. Next we’re hoping to review the beautiful Sam’s Journey which is currently in the final stages of QA and could land before Jan 1st. And follow Indie Retro News on Facebook for the latest breaking C64 news. 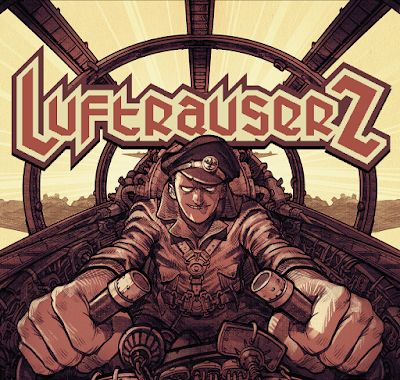 LuftrauserZ is a magnificently epic C64 shootemup, and one you can’t afford to miss... Future Zzap gold medal?! My retro remake Thrust 30 is out now!